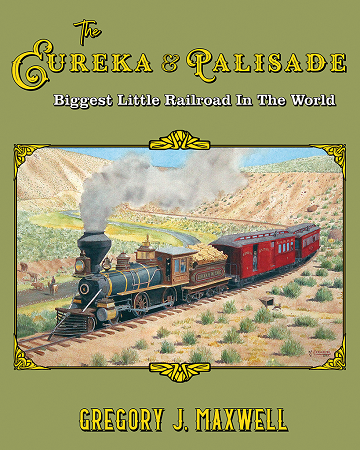 This new book tells the story of the narrow gauge Eureka & Palisade and its successor, the Eureka Nevada. Persevering through floods, fires, and the ebb and flow of the mining industry it served, the E&P was born in the bonanza era of Nevada mining and ran until the Great Depression and declining metal prices shut it down. Before that end, it hauled millions in gold, silver, and lead through the sagebrush covered hills of Nevada, cementing its place in the annals of great narrow gauge railroads. The E&P used everything from brand new, ornately-painted Victorian era locomotives and cars, to a motley collection of secondhand, thirdhand, and homebuilt equipment to soldier on in the 1920s and ’30s. The saga of the E&P is told in exquisite detail in 10 chapters of comprehensive text, 450 photos and illustrations, 41 maps, and 18 equipment drawings. Also included is a complete and detailed equipment roster, extensively illustrated.